The TrickleStar Tier 2 Advanced Power Strip not only safeguards your equipment from damaging power transients, it helps lower your electric bill. 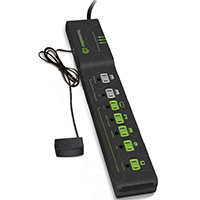 This 7 outlet advanced power strip offers 2 always-on outlets for devices that you do not want turning off automatically, 1 master outlet, and 4 controlled power saving outlets. The power strip senses when the control device (typically a television or computer) is on or off, and it then switches the controlled outlets on or off accordingly to prevent unnecessary power use from devices plugged into those outlets, eliminating what are known as vampire loads. The infrared (IR) sensor detects motion, and cuts of the power supply to the power saving outlets if no activity is detected.